The following is an excerpt from action director Lawrence Ribeiro’s new book Action Realism. Due to the speed and the nature of stunts and my overall point of view (shooting with the intent of making the images visceral or dynamic), I have come up with some exercises. Scenarios, locales, speeds and context of the story will dictate how I train. Sometimes you need a supply of guts, sometimes you need to overcome your fears, but the truth of the matter is that my feet rarely touch the ground when shooting. It’s more mental than physical, as a few close calls can throw you off your game. How I prep is different than how first (main) unit will prep. Obviously, the camera, lenses and workflow need to be covered, so that all the bugs have been worked out when principal photography starts. Let’s go over a few scenarios. Let’s assume you are going to the mountains to shoot. You need to know what the elevation will be. Is it 3,000-5,000 feet or is it 8,000+? You will need to train differently depending on the answer to that question. Do you live at sea level, or do you reside in Colorado with many of the Ironman athletes? Are you going to the desert… in the summer? That will take a toll on you if you are not used to it. It takes time to adjust. Another example: someone reached out to me for a shoot in which I had some interest, whereby I needed to rappel from a helicopter while shooting. That’s a tough shot as it is. Let’s explore this for a second. Will the blades be turning? Rotor wash (the air that is driven downwards from the propeller(s)) is a big deal. Is there a budget to have somebody at the bottom to control the rappel so that I can concentrate on shooting? If the blades are on, can they hear me and can I hear them? What time of day are we shooting: at the beginning of the day when we are fresh, or at the end of the day with “golden hour?” Will my colleagues be fresh too? I can only assume the worst and train for that. Does the guy at the bottom know what he’s doing? If not, I may not sleep too well the night before. Trust is a big issue. Actually, the whole business is based on trust. The decision process is based on precise questions to the production manager or producer, consulting with colleagues, and instinct. I have spent some time Heli-logging (logging with helicopters) in the mountains in British Columbia. We used the Sikorski 64, a jet-propelled helicopter. It looks like a dragonfly. At the time, it was the fastest vertical climber on the planet. I have to admit, it was one of the most awesome pieces of machinery that I had seen! Each cycle, extracting from the “hill” to the L.Z., took 90 seconds. If you are at the bottom, it’s easy to forget that time is passing, and the pilot of the S-64 sounds off the siren, which is usually a rude awakening. Moreover, the frontend loader is pulling the logs aggressively, and if you get caught next to the chokers, which is what we called the cables, they will break your leg or arm like a twig. We had two or three hospitalizations per week. When you are on the “hill,” it’s a bit of a different animal. Because the logs are just lying on the ground, there is debris everywhere from where they were felled (cut down). As a result, you are not actually walking on land. You are, on average, three to five feet above the ground. This is the point of this story. I had to learn how to walk on the logs. We called it “bush legs.” Essentially, you “walk” like an animal. You are springing from log to log. Now, when the S-64 would come down, it was kind of tricky, because the rotor wash was so intense that tree limbs would fly up at you. So, you had to have three routes of escape. The hook, which doesn’t really look like a hook by the way, is about the size of a small desk, and you connect the chokers to the hook. When you bolt out of there you give the pilot the command “clear.” If you misstep, you are screwed, to put it mildly! This experience, for me, has become invaluable for shooting, especially for fights. Your reflexes are so sharp, that I recall roughhousing with my buddies after I came out of camp, and they were all on the ground in a few seconds. Think about it like this… you are essentially sprinting all day on uneven ground, twelve hours a day minimum, and one mistake means you are taking a trip to the hospital. Everyone has experiences that they can draw from. You’ll have to make an examination of your skills to determine what you can use. You have to ask yourself if your skills can be used in the vein of moviemaking principles. That’s the key. One stunt/fight coordinators I’ve shot with, Steve Hart, had a great tip for shooting fighting. First was the idea of “happy feet.” It means the two fighters get so excited they are a little out of sync: moving too quickly, over-embellishing what’s going on. The second part was instead of 75% speed, then 100%, we went 50% then 75%, and he asked them to “commit.” Really sell it. From a camera operator’s perspective, this makes it easier to get the shots, and you can get in sync with the fighters quite easily. Compound this with my “bush legs” from logging, and the shoot was a piece of cake. Further, because of Steve’s background as a fighter, as well as his affinity for and understanding of cameras, it made for an efficient shoot. And it looked good too! And this, in essence, is what this book is about: meshing well to make a more efficient product that is more visceral! There are other things that you can enhance yourself with to be a better shooter. Go to the gym, ride motorcycles, do martial arts; essentially you can do anything you can think of that can improve your abilities for what you need to do better in terms of shooting various stunts. You need to keep your reflexes sharp. One of the drills I use is working with half a ball, called a bosu ball. One side is curved and soft and gushy, and the other side is flat. The soft gushy part goes on the bottom. I stand on this and then I use two balls that I bounce against a wall or mirror and try to catch. The smaller the ball, the faster the response. You can slow it down by going further away from the wall or using bigger balls. Sometimes I use red, green and blue balls, as these are the basic components of color. For variations, I will change the height or close one eye. The variations are endless. And you can’t leave out footwork, because feet planting is a vital aspect, especially if there is any kind of risk. It doesn’t matter if you are going down the stairs backwards or hanging from a helicopter. Footwork is important. In some cases, you’ll have a spotter, but you may not. And there’s a bit of a learning curve to finding the ideal spotter. Kicking the ball against the wall or doing some sort of soccer tricks is good for dexterity of footwork. You’ll find weaknesses in both the upper and lower parts of your body. In either case, it’s best to work on your weaknesses as opposed to working your strengths. Some may or may not know that Bruce Lee was a champion in cha cha. 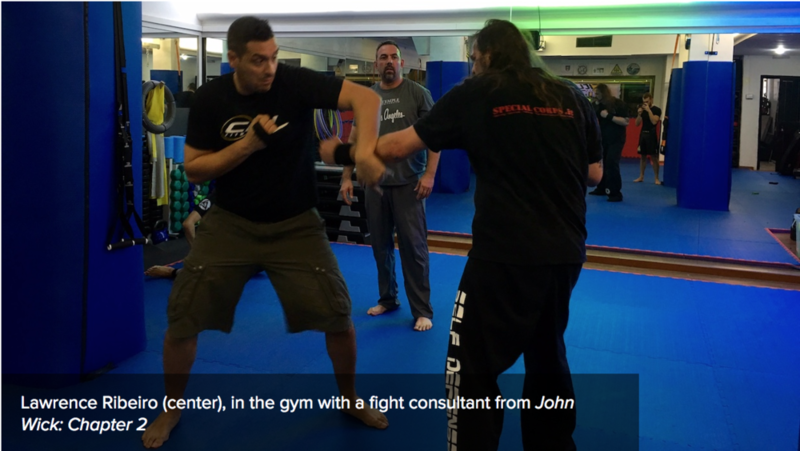 Obviously, he was known for his martials arts, but when dealing with choreography, footwork is the foundation. It’s just something to think about, based on how you shoot and your particular skills. There are multiple drills and exercises that I have developed for different scenarios, and I pick them out of my arsenal depending on the shoot. You’ll have to discover what those are for you. In closing, you generally need to be fit and ready, and if you are, and the opportunity arises, you’ll be able to take advantage of it.